A patient old woman paces back and forth near a squat wooden house. She is waiting for bread. “Good morning! You want two as usual?”. A small truck drives up to her house and the driver is smiling as he opens the door of his vehicle. The frosty air is filled with the smell of fresh bread. Bread is brought from neighboring Efremkino to the village of Malaya Siya, which is tucked away in Khakassia on the banks of the Bely Iyus river. 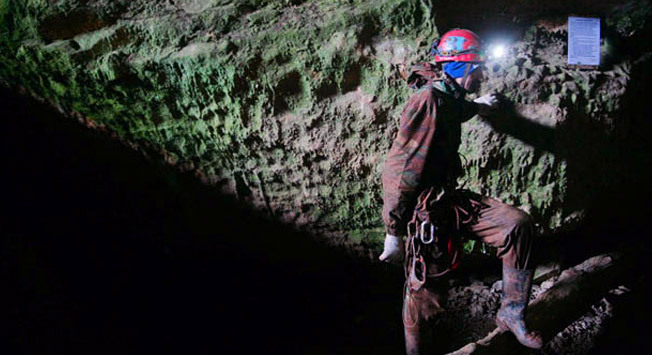 There are more than 40 caves of different levels of complexity that can be explored around Malaya Siya and Efremkino. According to Oleg Dobrov, a Novosibirsk researcher, "there are those that can be entered by simply bending over slightly, and those where you would need to rappel down tens of meters." Over holidays and summer vacations, adult speleotourists come to Malaya Siya as well as college students and school kids from Novosibirsk, Tomsk, Krasnoyarsk, Irkutsk and other Siberian cities. And then the village is filled with sounds. You should never enter a cave, even the easiest one, without an experienced instructor, since you will need at the very least special equipment and clothing, not to mention the ability to safely make it through the difficult parts of the route. When you are in a cave with reliable speleotourists, do not litter, do not shout, and talk in a low voice so you don't wake up the bats that live in the cave and harm them.